Have you been to one of our Sunday Concerts in the summer or our Chamber Series throughout the year? Maybe you’ve seen a Senior Stages performance or enjoyed a family movie at The Kenley? We are very proud of the programming we offer and the amazing local talent we are able to showcase, but it would not be possible without the generous support of donors like you. Please help us keep 80% of our programming absolutely FREE to the community and consider a tax deductible donation to the Davis Arts Council. We cannot express how much we truly appreciate you! If you would like to know more information about the Davis Arts Council's history, mission, and values, please click here. 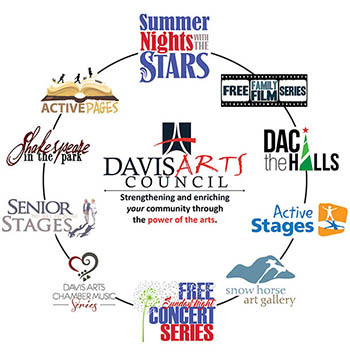 Your association with the Davis Arts Council will provide your exposure and will also benefit the community. Learn more. Our events and programs owe much of their success to wonderful volunteers. Click to help.